You’ve probably heard this before: "Your blood could save a life." That’s because it’s true. And you’ll have an opportunity to roll up your sleeves again this year. The 34th annual County Blood Drive officially kicks off Wed., April 4 and will last through the end of the month. You are encouraged to donate blood and, if you qualify, to register to be a bone marrow donor at Be The Match. Donating blood and bone marrow is safe, costs nothing and could save a life. Bloodmobiles will be at 20 County worksites across the county throughout April. You can make an appointment, or just walk in. 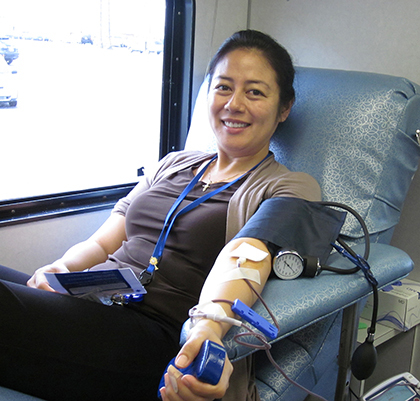 The drive is one of the largest for the San Diego Blood Bank. Last year, County employees donated 444 pints of blood. The goal for this year is 500 pints. You are also encouraged to register to be a bone marrow donor. It is easy and pain free. All you have to do is swab the inside of your cheek and you can do it at one of the blood donation sites. You can register at Be the Match. Be the Match is specifically looking for donors between the ages of 18 and 44 because doctors request them 95 percent of the time. This is because medical research has shown that cells from younger donors lead to better long-term survival for patients after a transplant. Registration is completely free. People older than 44 can also join the Be the Match, but will be required to make a $100 payment at the end of the online process. The donation is tax deductible.